'Why ELVIS Left The Building' New Re-publish: The very misleading publicity states of this book ... .. "Before there was Michael Jackson and The Beatles, there was Elvis. Of all the entertainers who have influenced pop culture over the past 50 years, Elvis Presley stands at the top. His influence can be felt in music, film, fashion, and in the emotions of all the lives he has touched around the world. In this phenomenal book written by Heart Lanier Shapré, amazingly, seven lost years of the King’s childhood are revealed. Learn the foundations of what shaped this mega star’s life. 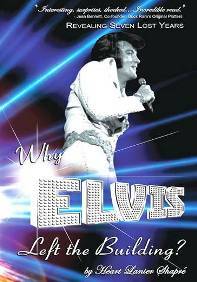 'Why ELVIS Left The Building - Revealing Seven Lost Years' explains the truth of these lost childhood years based on interviews with the book’s narrator, James Samuel Denson, who was selected by Gladys Presley to help raise her son Elvis, and on the DVD Elvis Through My Eyes. Notes the author, "The story has to be told; there was a person up there on stage beneath those costumes who had struggles, FBI involvement and is a phenomenon of life. What was the price?" To quote Elvis, "My image is one thing and the human being is another … it’s hard to live up to an image." EIN questions, how can a published book's contents be so contrary to its own publicity?! "Every day of his life he was pitiful, pathetic and no-one on earth to worship and idolize. He was to be pitied every day of his life. He was a victim every day of his life. He was being victimized before I met him, the day I met him and every day of his life he was being victimized. He was the only human being I know that had to be protected, physically, every day of his life by other human beings. He's the only one I've ever seen. He's the only totally genetic infantile baby that I ever knew." When reading this book it is not hard to imagine something has obstructed the vision and memory of Jimmy Denson. This could well be the book to rival Albert Goldman's mean spirited and much reviled, 'Elvis'! Like the widely denigrated Goldman biography, separating fact from fiction in this totally over the top account of the Elvis story is challenging. It is a book well suited to the now, largely defunct Elvis "underground", with its sensational, colorful and fantastic claims, observations and beliefs, all neatly wrapped within a somewhat out of place spiritual texture. At times you will laugh out loud, at other times you'll want to wring Denson's neck! Both books are a revisionist dream. Interspersed with some solid research, Goldman set out to destroy the existing Elvis legend and replace it with one of the most damming and depraved accounts one could imagine. Jimmy Denson's account, as told to writer Heart Lanier Shapre, approaches its subject in a strange, hybrid manner where the narrator professes great love for Elvis and then details him as a pitifuly scared, drug addicted youth with rotting green teeth. After so many mundane and repetitive biographies piecing the Elvis story together in the same one-dimensional jigsaw puzzle like mosaic, this books hits you right in the face with its 'out of left field' rancid picture of the King of Rock 'n' Roll. "Well, it's a satanic form of religion, Satan-inspired. I saw the Devil in Elvis' brain one day and his Momma told me to look. She said, "Jimmy, look at Elvis' eyes," and "Elvis," she said, "show Jimmy what you showed me" and he flashed his eyes and his skull looked like… his eyes looked like two pissholes in the snow. And back in his brain I saw Lucifer in there. July 5th, 1956. He was stoned out of his head"
Denson traces Elvis' drug addiction to his days living in the Lauderdale Courts in Memphis. Starting out as a typical youth experiment with glue sniffing it progressed through the inhalation of gasoline fumes to amphetamines. If you believe Denson (and a small number probably will), Elvis was a certified drug addict during his teenage years. This makes it seemingly consistent with the use of pills by Elvis, et al, during Sun Studio days (as portrayed recently in the critically acclaimed film, 'Walk The Line'), a claim very much at odds with the usually told story that Elvis' pill problem started when he was in the Army. Despite its often repulsive narrative, 'Elvis Through My Eyes' threads a spiritual theme replete with biblical quotations. It is a strangely concocted brew! Heart Lanier Shapre's narrative is also unusually structured, its text flowing in a generally chronological timeline but punctuated by hundreds of quotes and biblical diversions. Many of the quotes are from Jimmy Denson and his bother, Jesse Lee, while others are from members of the Memphis Mafia, third party authors, Al Dvorin, and a female Elvis impersonator. The litany of amazing claims is staggering and hard to comprehend, as are Denson's gems of wisdom and observations, all of which continue to flow like an unstoppable, raging torrent careering down a stream. Elvis was a babyfied male..."he was a skin and bones baby and one time, while in front of the old St. Joseph's Hospital on the corner of Jackson and Lauderdale, a gang of kids came by; a gang in front and a gang across the street and they started yelling at him, "Hey, baby! Mama's baby! Sissy, baby!" Jimmy & Jesse Lee Denson were Elvis' "...mentors, his masters, we were the power in his life"
Denson also suggests (the not new idea of) a surrogate, neo-incestual relationship* between Elvis and Gladys, adding a statement that Gladys often said of her son, "He'll never be normal". Denson further suggests George Klein, wanting protection from school bullies, hung around Elvis hoping the Denson brothers would protect him too. Jimmy Denson claims he was taken aback at how George idolised him! It's nice to be wanted! The underlying purpose of 'Elvis Through My Eyes' appears to be to showcase Denson's ego and need for recognition at Elvis' expense. If it wasn't for the Denson brothers, Jimmy Denson would have you believe Elvis could have been in real trouble. Others will argue if Elvis did indeed spend a lot of time with the brothers, he was definitely in trouble! That audiences watching the documentary, 'Altered By Elvis', which features Denson, laughed out loud at some of his preposterous claims, says a lot about his credibility. A. His elevator doesn't go to the top? B. A couple of Jokers short of a deck? C. Someone who stayed in the boxing ring a couple of bells too long? On the back cover of the book are the words: Eternal Love Vigil In Song. Cute device but outdated, and very much in contrast with the often debasing nature of the narrative inside. The book's image gallery comprises a series of low grade, dark black & white visuals including many of various Elvis tribute artists. A few of the Elvis visuals are reasonably rare. 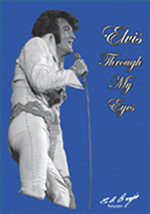 When the tirade of online messages (see above) vehemently criticised 'Elvis Through My Eyes' earlier this year the 'negative' publicity was in fact a positive, as interest in the aspersive nature of the book saw online sales spike, at least temporarily. On Amazon, the book dramatically rose from around 330,000 to inside the top 100,000! Undoubtedly many fans wanted to see what the fuss was all about, and in all likelihood this review will have the same effect. To understand even more about this book EIN thoroughly recommends that you go to EIN’s good friend Lee Dawson’s Elvis Express Radio archives - and listen to his 2009 interview with the very odd Jimmy Denson upon whose recollections this book is based. It is possibly the most insane thing you will ever hear. CLICK HERE. Overall Verdict: I found 'Elvis Through My Eyes' to be strangely riveting, and at the same time, totally repulsive. It is one of those rare, colorfully extreme works that is so bad it is almost good. For many, it will leave a long lasting bitter residue for all the lies and bitterness it contains. You've been warned. It is a very unpleasant book. And yes, it will have little trouble sitting comfortably alongside the widely despised Goldman biography. Dear old Albert must be turning in his grave now that his carefully planned notoriety is being usurped by what he would term a virtually unknown country hick. *Note- Dee Presley, Elvis' former mother-in-law, achieved worldwide tabloid attention by once suggesting an incestual relationship between Elvis and Gladys. The real issue between Elvis and Gladys is appropriately explained by psychologist, Peter Whitmer, in his absorbing pschological profile of Elvis, 'The Inner Elvis'. Go here to the author's website for her version of the book's details - it makes very different reading. -Copyright EIN MAY 2011/April 2006 - DO NOT COPY. Anonymous: I WILL REMAIN ANNOYMOUS BUT HAVE TO SAY IN DEFENSE OF James Samuel Denson THAT HE DEEPLY LOVED ELVIS AND DID NOT WANT TO SEE HIM ON ANY TRACK THAT WOULD LEAD TO ANY TYPE OF DESTRUCTION. DENSON’S EMOTION EXPRESSED IN THE BOOK EXPLAINS HIS OBSERVATION OF A BOY HE LOVED AND DID NOT WANT TO SEE DISILLUSION HIMSELF. DENSON’S DESCRIPTIONS OF ELVIS DESCRIBE WHAT HE SAW THAT HE DID NOT WANT TO SEE HAPPENING – THE READER MUST UNDERSTAND THAT POINT AND DISREGARD ANY COMMENTS THAT ARE CONTRAY TO DENSON’S LOVE FOR ELVIS AND MAYBE BETTER PUT AS HIS HOPEFULLY PROTECTIVE DESCRIPTIONS. ANY DESCRIPTIONS OF ELVIS EXPOSED WHAT HAPPENED TO HIM THAT DENSON DID NOT WANT TO HAPPEN. ONE MIGHT EVEN CALL IT DENSON’S FEAR OF LOSING HIM. Ida Ritter (USA): I read your review and have to say that I am in complete agreement with your verdict about this book. I red about this book before and I also listened to an interview that Lee Dawson from EER made to Denson and when I listened to him I made up my own opinion about this evil man, at the end of the interview he even used four letter words towards Lee at which he did not even responded, the way he talks and the tone of his voice full of hatrage says it all. What are the real reasons this man had to write such bunch of lies and damaging material that only tries to hurt Elvis's image and reputation only he knows, he is so full of bad intentions and as a human being deserves no respect at all from any other human being. But again some Elvis fans will buy anything referring to Elvis but in the again I cannot blame them for wanting to read first hand what is said about Elvis instead of taking second hand news about it. We all know the drug problem Elvis had, the Memphis Mafia said all in their book without hiding anything (drug related of course) proff exists that the drug problem started while he was in the army, I heard from some other people, a lady that still lives at Lauderdale that Denson never had the kind of relationship with the Presley's that he pretended and portrayed in his book. I hope nobody believes anything of what he wrote in this evil book.